Your Style, Your Goals, Your Life. Trends for Teens encourages teenagers to set goals for themselves by providing incentives—which consist of clothing, accessories, and other goods—within our stores. We currently have 6 stores running within 2 different types of locations. We currently have 4 stores housed in schools, all located in the metro-Detroit area. Learn about our Pontiac, Detroit, Wyandotte, and Mount Clemens locations below. Our 2 other stores are set-up within housing shelters located in Detroit, Michigan. Check out our COTS and Christ Child stores below. We had the pleasure of opening our first store at ITA in Pontiac, Michigan in February, 2015. In November, 2016 ITA moved to a new location and our store moved with it. This store is run by seniors and juniors at ITA. We are excited to start our 3rd year with ITA in the fall. Since we have started at ITA, their school has grown to encompass elementary-aged kids. After great feedback from ITA, we decided to expand the Trends for Teens goal setting program to “Trends for Tots” where children are rewarded with Trends Cash because of good behavior both in the classroom and outside of the classroom. Very special thank you to Chloe Kiriluk for filming this amazing video which embodies the happiness and satisfaction the students experience after shopping at our store! Founded in the 1990’s, Loyola High School is a Jesuit Catholic High School based in the city of Detroit. It serves to further academic, physical, spiritual, and social growth to the residents of Detroit and its surrounding community. It was founded to address the soaring drop-out rates of high school students in the Detroit area. Loyola now proudly graduates 100% of its students. Spearheaded by our latest Co-Leaders, Ray Margherio and Drew Prokop, Trends for Teens has decided to aide Loyola in their Letter Sweater Club Initiative. Earning a varsity letter in athletics, debate, choir and/or drumline is a symbol of excellence and milestone for many high schoolers. At Loyola it is no different, however, due to the prohibitive cost of varsity jackets, most young men keep their hard-earned “L” at home in a drawer. Letter sweaters are universally appealing, help unite Loyola students participating in different school activities and—best of all—are dress code approved and will make a difference with our young men allowing them to look and feel good! A Bulldog sweaterman has pride and will be motivated to keep up the great work. The Letter Sweater Club Initiative allows donations to be made through Trends for Teens to provide Letter Sweaters to the 75 varsity letter achievers who do not have a sweater. We first moved to Wilson Middle School in Wyandotte, Michigan at the end of the 2015-2016 school year. The store grew even more popular during the 2016-2017 school year. We will continue to deliver donations to the store weekly throughout the 2017-2018 school year as well. We started to implement our organization at the COTS location by merging our "5 A's" ideology to their program called the "Passport to Self-Sufficiency" giving adults within the shelter an opportunity to become self-sufficient. Trends for Teens serves as the "Passport to Self-Sufficiency" for the teenagers and young adults living at COTS. We opened our Trends for Teens store at COTS in March, 2016. The first two shoppers at our store! Trends for Teens is so happy to have partnered with Christ Child in Detroit, Michigan through Brother Rice High School in early 2017. 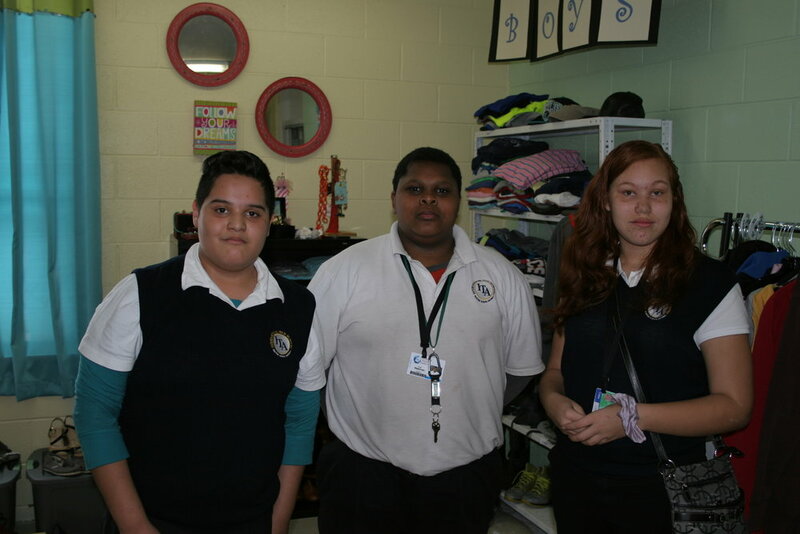 Christ Child houses anywhere from 15-30 homeless boys at a time and our mission is to provide them with new clothing after they have achieved goals they have set for themselves. Read more about what Christ Child does on their website. In March 2018, Trends for Teens expanded to an even larger market as we opened our first store at an elementary school in Mount Clemens, MI. Seminole Academy continues to impress us each and every day as they have implemented our goal-setting program into their students' lives. From Kindergarten to Fifth grade, the students are dedicated to setting and acheiving their goals. We currently do not have a very large inventory of elementary-aged clothing, so clothing donations for this age group would be greatly appreciated. Learn more about clothing donations here.